(green paper towels),our cotton scrubbies with nylon for that extra clean or our reusable facial cleaning items and bath items. Our items are designed by us and many are handmade.These make great gift ideas and we love to create those custom items as well! You can check us out on Facebook in our Going Green album. Let us know what you think, we would be happy to hear from you! Check out our "Going Green for Christmas" album! I would have liked to post a bit earlier but I have had some allergy problems. If it is getting into spring full force wherever you live you will understand. the pollen has reach epic portions here in Arkansas from our really early very warm weather =) But it will pass in time, we hope. Jennifer Johnson from Waldorf Maryland. She got it in plenty of time and was able to hang it on her front door for the Lucky holiday! I hope to get a picture from her soon to show everyone. Since it is still St.Patrick's season and March we would like to spotlight our Irish Dance Department . 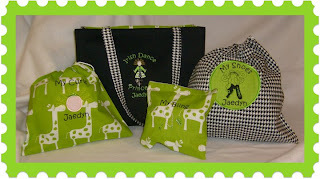 If you have or know an Irish Dancer anyone of our specialty items would make excellent birthday gifts for them. One special item to take to a Feis, the Oireachtas or to World's as a great gift for them would be our Tote Bags and Tote Bag combo sets. 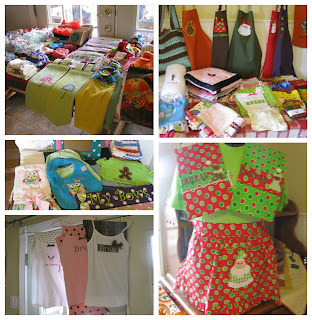 They make great gifts for everyday use and are well constructed to stand up to much use. The bags come with pockets in both side inside, and a cellphone pocket on the back side. The combo set comes with a shoe bag, a wig bag and a bling bag all co-coordinating with your bag.Check it out in the picture below, These are fully customizable as well and they also come with a zipper (extra charge). We offer a wide variety of items for you to choose for your special dancer and names can be added to most items! Check out our pillows, medal banners, pillowcases and other great items! Now is the the time to think about those gifts you might need! It seems like the holidays have just past but now it's spring here in Arkansas, St.Patrick's Day is just around the corner and summer not far behind! Many might wonder who the little girls are that I always have in my header pictures. These are my two grand daughters, Ivy & Beatrix. They are the children of my two daughters, whom I have named my business after. 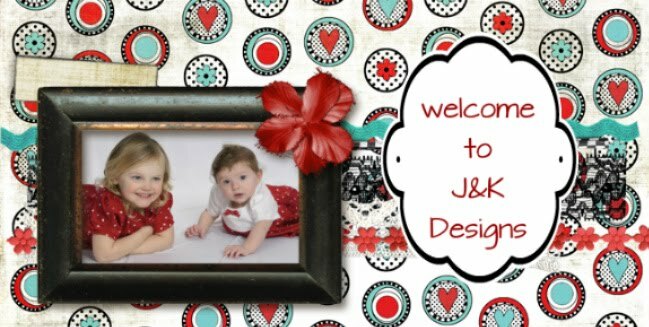 Jenny & Kelly, the J&K of J&K designs! Being a grand parent is a whole different experience and one I wouldn't change for the world! I love these little girls and both they and their mom's give me a great deal of my inspiration!! We hope to be soon introducing our next new product "Growels", your new green alternative to paper towels.I will be sending a set out soon to our first tester and I will be looking for 2 more to help out. Once everyone has a chance to use them and see how they work and I get feed back then I will begin to offer them online and on face book.We gave up using paper towels about a year ago and while it was a bit of a change to say the least we have become very accustomed to it. It saves money, and helps with paper waste as well! In honour of the day we have a free drawing for one of new home banners. 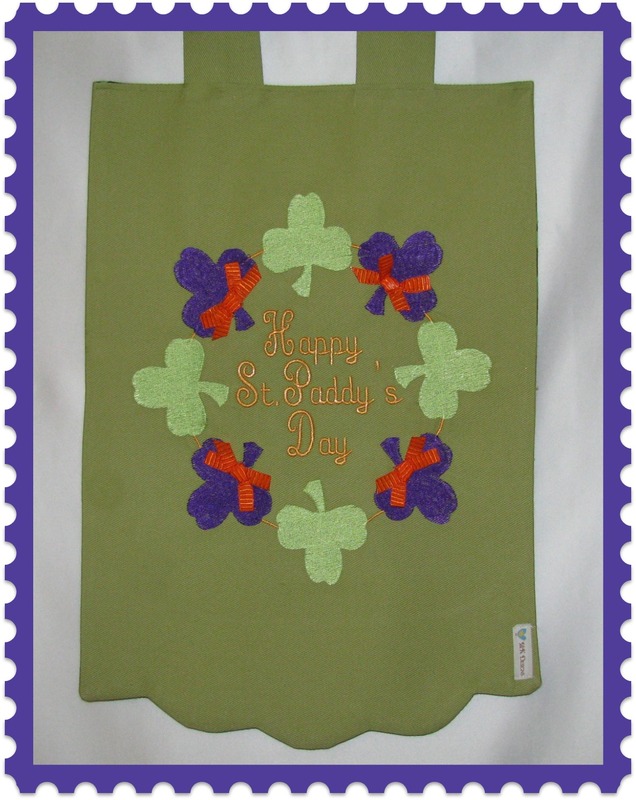 This one is decorated with cute Shamrocks and "Happy St.Paddy's Day in the center.This would make a great gift for some one or to hang on your front door!No purchase is required and you can enter until March 10th. Then we will have time to mail it out to the winner in time for the holiday!What fun. I love making these and have many ideas for these. I will add them to the web site hopefully soon. 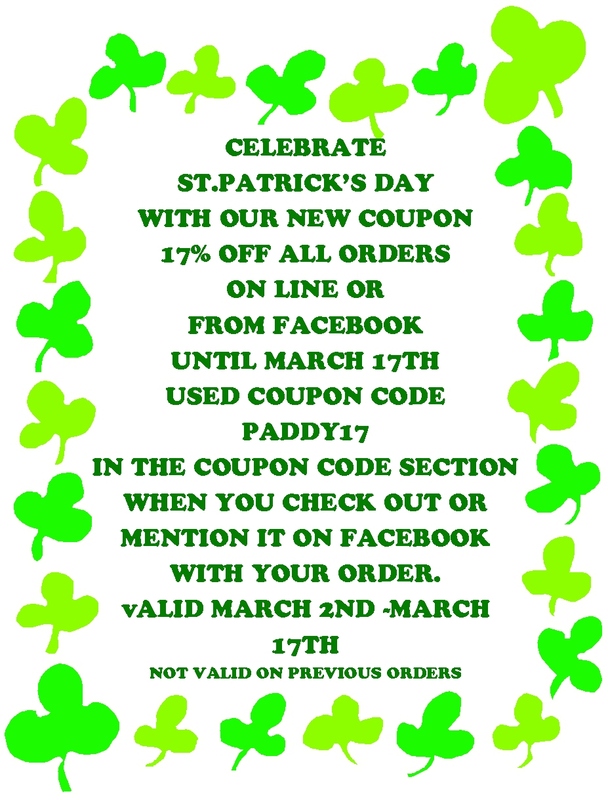 We have a coupon this month as well for 17% off your entire purchase. This would make a great discount on any orders you would like to place. 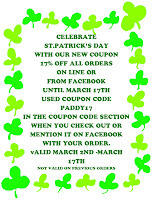 This is good until March 17th, 2012. we would love to create your wedding or baby or graduation gift or many other custom items you might need. Check out the coupon here. I wish everyone a wonderful week! 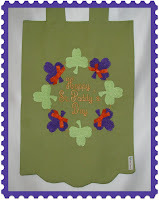 Labels: free drawing, going green, grandchildren, JK DESIGNS, paper towels, St.patrick's Day.